So it seems like summer is starting to get underway here in the UK (not that we want to jinx anything!) 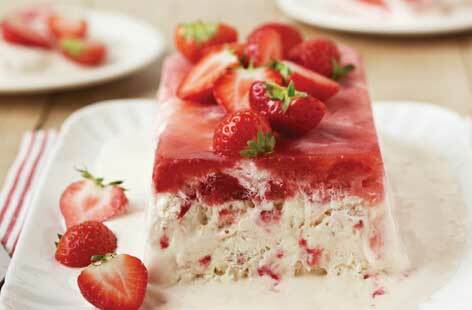 and here at Cellardoor HQ we've been starting to think of yummy treats to help cool us off - and this yummy frozen strawberry dessert is one of our faves! - Place over a saucepan filled with 1 inch of water. Using an electric whisk, beat the mixture over the simmering water for 4 minutes. Remove and continue to whisk until thick, frothy and completely cool. - Whip the double cream and fold into the egg mixture along with half of the strawberry purée. Oh my goodness, this is amazing! Definitely going to attempt making this!